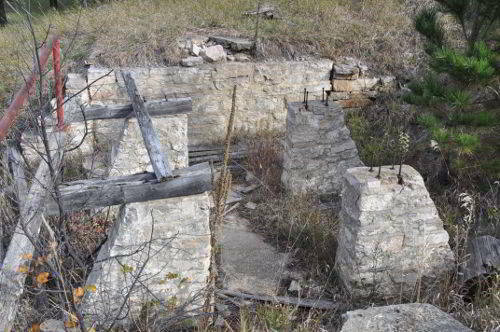 Camp D-Army-1 was the only CCC camp in South Dakota where the work projects were supervised by the U. S. Army. It opened July 20, 1934, and closed October 31, 1935. It was then occupied by District Headquarters Company for a few months. It reopened in October 1936 as Camp SCS-6 and closed in July 1942. On about July 5, 1934, army officers arrived at Fort Meade to take charge of a new company and new camp (1935). On July 10, 18 enrollees from Camp F-5 (Rochford) arrived at Fort Meade to serve as a nucleus for the new company and begin the establishment of Camp Robert Fechner. They were sheltered in a hospital ward tent behind headquarters troop of the 4th U.S. Cavalry and messed with that group for a time (1935). 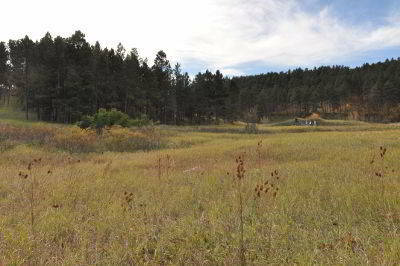 Construction of the camp on a beautiful site at the west edge of Fort Meade proper, in a natural bowl bordered on three sides by pine clad hills, was initiated by 10 or 12 carpenters (1935). Through rains and wind, the cadre of Company 2758 soon learned to cope with tent living. These rains and wind, too, put many difficulties in the path of rapid and satisfactory construction, but everyone dug in and made the best of the obstacles encountered (1935). On July 20, 220 hungry and weary enrollees arrived. Their first meal was cooked on two field ranges under a storage fly (1935). For 2 weeks light tasks occupied them until they became accustomed to the new environment (1935). The work project, for which the company was organized, differed from other projects in that its objective was an army one. As such, it was directed by an army officer instead of a camp superintendent (1935). During August the mess hall, bath house, and latrine were used for the first time. The inconveniences of inadequate bathing facilities and the difficulties of eating on the ground in any weather were ended (1935). On October 1 joy prevailed. On that date the men moved into the barracks. They no longer had to climb out of bed onto cold, damp floors on frosty mornings (1935). October 5 found the officers in their permanent quarters. No history was written for Company 2758 in 1935, but the histories of Headquarters Company and Camp F-3 (Este) state that Company 2758 was demobilized October 31, 1935, and over 100 men were transferred to Camp Este (1935). Starting 0n May, 1933, 32 men served in a service detachment. After the last company left for the field (in June) they were quartered in one of the deserted mess halls of the reconditioning camp at Fort Meade (1934). During late August the detachment was moved to rooms above the Fort Meade Post Exchange. The truck drivers were later moved into the band barracks (1934). The men in the detachment were rationed at Machine Gun Troop, "A" Troop, and "B" Troop. The casuals were rationed at Troop "F" (1935). On October 7 the detachment was organized as a service company. Its strength was increased to 70 men, gained by transfers from various companies in the field. It included the freight detail, additional clerks, and truck drivers (1934). As a service company it developed into a highly trained group of specialists, successfully performing varied duties at district headquarters. The company supplied the clerical, warehouse, and transportation details to the quartermaster in the supply of food, clothing, and equipment for work companies in the district. Other duties were those of clerks in district headquarters, radio operators at the post and the radio equipped camps, telephone operators, printers, messengers, truck and car drivers, mechanics, surveyors, hospital wardmen, and general details (1935). All recreational facilities of the post and vicinity were enjoyed by members of the company--the theaters, golf links, bowling alleys, dances, and incidental amusements of both the town and post. The company had active bowling, football, and basketball teams. Educational courses in first aid, journalism, automotive mechanics, radio, shorthand, and carpentry were offered (1935). On October 31, 1935, a replacement section was started at district Headquarters Company, making the enrolled strength of the company approximately 175. These men did thinning and cleanup work on the Fort Meade reservation. Whenever a vacancy occurred in any of the work camps in the district, enrollees of this replacement section were transferred to the various camps (1936). 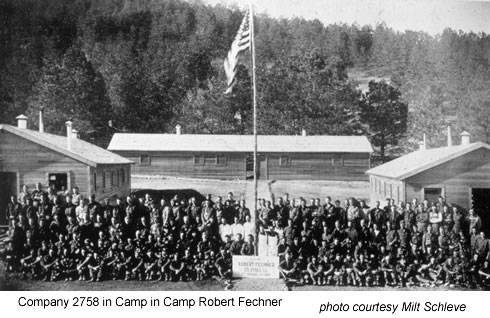 The members of the company were quartered at Camp Robert Fechner, the former home of Company 2758, which was demobilized on October 31, 1935. The company started operating a mess of its own November 1, 1935, having rationed with the various troops and Company 2758 prior to this time. The rationing and quartering of the casuals was provided by Headquarters Company (1936). 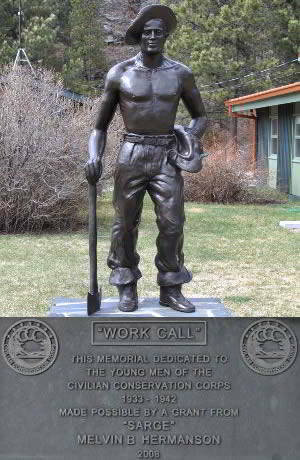 Notes: D-Army-1 was the only camp in South Dakota where work was supervised by the U.S. Army.